, a firm bite and powerful flavour is the hallmark of this type of condiment. 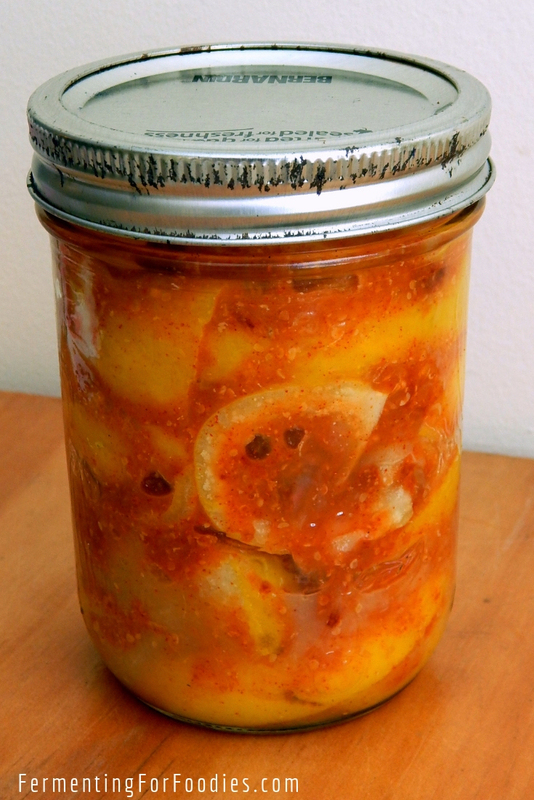 Fermented lemons are very easy to make at home. 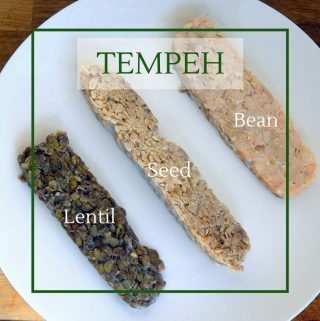 They are a delicious condiment to have on hand to add a bit of zip to all sorts of meals. 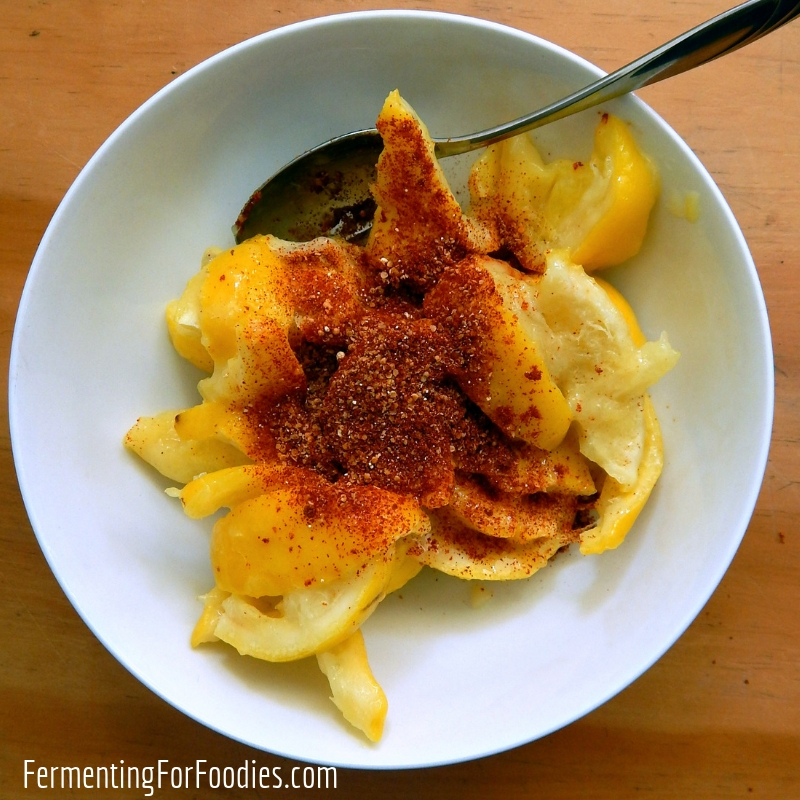 the roasted spices to lemon pickles transforms them into a flavourful condiment. frying pan is perfect, because you can add the spices right to the hot pan, and they only roast for 1-2 minutes. Wash the lemons well, and place them in a pot with the turmeric and cover with water. Slowly bring to a boil and boil for 8 minutes. Drain well and allow to cool before handling them. Cut each lemon into 8 sections and remove the seeds. They will be quite juicy, so cut them over a bowl to catch all the pulp. Sprinkle the lemons with the salt and pack into a sterilized glass jar with a tight-fitting lid. 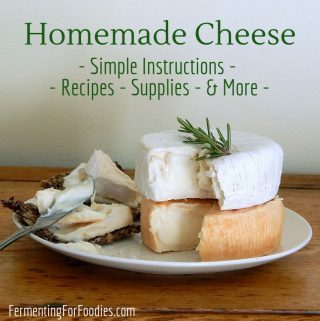 Allow to ferment at room temperature, turning the jar over every day. 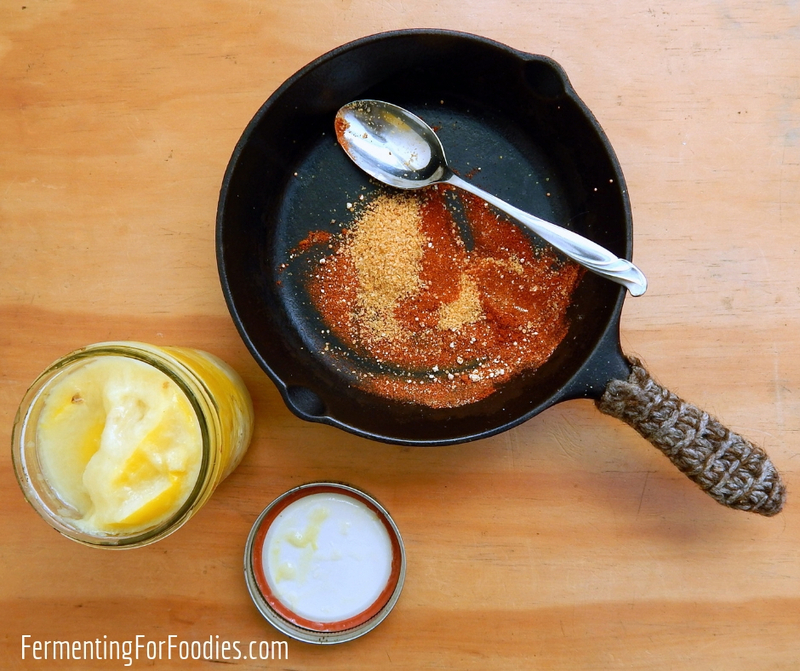 After fermenting for 1 week, dry roast the spices, then mix them into the lemons. Pack the lemons back into the fermenting jar. Top the lemons with the oil to act as an air barrier for storage. 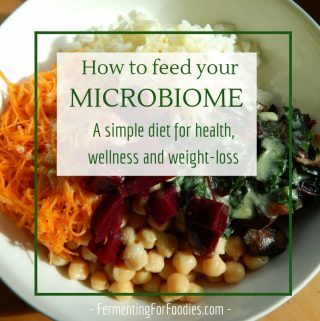 Store in the fridge and consume within 6 months. Yellow mustard seed doesn’t have the same flavour as mustard powder, however, you can replace the seed with mustard powder if required. You can also grind your own fenugreek seeds, it’s just fairly difficult. This recipe is perfect for a mason jar with a metal ring lid because it provides a good seal. 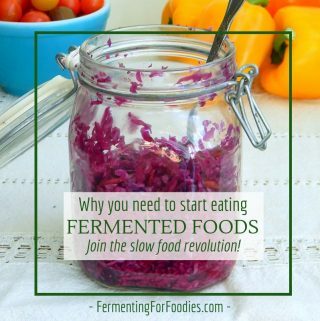 The metal won’t stop the fermentation process, but the acidity isn’t good for the metal, so don’t reuse the lid for canning. 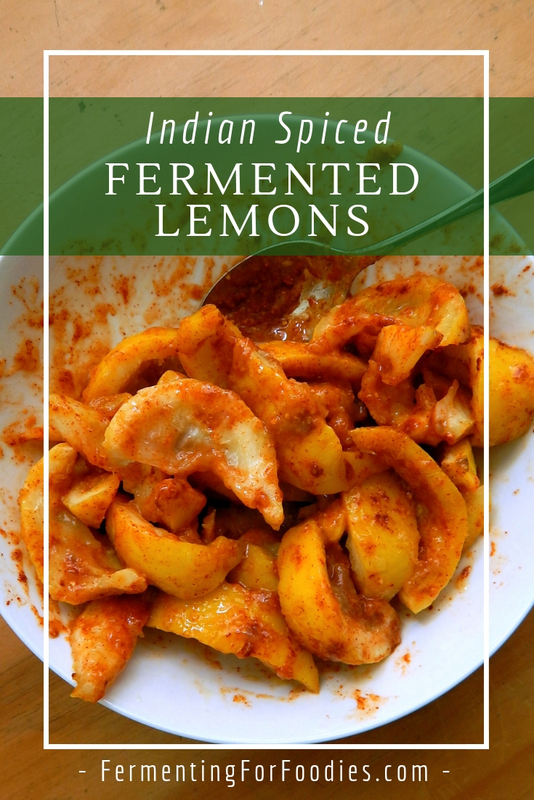 Lemon pickles are the perfect accompaniment to an Indian meal. Yum! Serve Indian lemon pickles with a Buddha bowl for a bit of extra zip. Pickles can be the star of the show when served with rice and yogurt. or a piece of roti or naan. I’ve made lime pickle however didn’t fill the jars to the top like your pic- instead about an inch below the lid. Also when inverting the jars they leak a very small drip- I think because there’s no ring seal. Will they still be okay to eat? They’ve been doing their thing for a week. If they look and smell good, then they should be fine. Why non-iodized salt in particular? If I were canning these for a longer period, could I just skip putting the oil in and water-bath can them? I’d be looking to make extra and then store it. Iodized salt will prevent the fermentation. I have kept them in the fridge fore 2-3 months without spoiling. But if you wanted to can them for gifts or long-term storage, then I would still add the oil. It helps with the flavour.